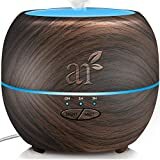 What Is the Best Aromatherapy Humidifier? If your home is like ours, it gets dry when the cooler weather comes along. 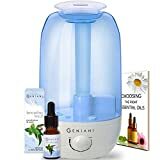 This dryness can cause irritation that keeps my kids up coughing, and I wanted a way to combine my love for essential oils with my need for a humidifier. This is why I started searching for a humidifier that uses essential oils. I’ll admit, I didn’t have high hopes going into my search, but I really didn’t want to have two devices running in the same room. However, I was pleasantly surprised by the number of options available. 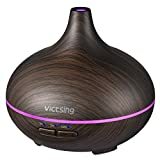 This inspired me to write a short buying guide and review five of the best oil diffuser humidifier products available. You can read all about it below! Can You Add Essential Oils to Your Normal Humidifier? An aromatherapy humidifier combines being able to diffuse essential oils with adding moisture to the air through dispersing water. Instead of having both an essential oil diffuser and a humidifier in the rooms you frequent the most, you can scale it back and have just one. If your home is as busy as mine is, this is excellent news! You won’t have to worry about finding space for two devices, maintaining both of them, or cleaning them. You can simply fill it, add your chosen essential oil or oil blend, and switch it on. It’ll introduce moisture to the air to fight in dryness, and you’ll get the benefits of your essential oil at the same time. What if you already have a humidifier that works great and you want to add your oils to it? Can you? The short answer is no. Normal humidifiers can’t withstand having essential oils added and running through them. Some of the oils can be very strong, and this can lead to it eating away at the plastic components of your humidifier. Additionally, they’re not designed to have a special area to hold your essential oils. If you buy an essential oil humidifier, they usually come with an oil feature or tray to place your oils. This makes cleaning it up or switching out the essential oils much quicker and more efficient. These special areas for essential oils can also withstand the more potent oils without breaking down. If you do put essential oils in your normal humidifier, you could end up with a cracked tank or parts that malfunction. Worse, your manufacturer most likely won’t pay for a replacement because it’s not a manufacturer defect or damage. The damage came from misuse on your part. The great thing about aromatherapy humidifiers is that they can tackle a broad range of common issues around your home. I’ve found several more since I started using mine, and I wanted to share my findings with you. The most obvious benefit of this type of humidifier is that it disperses moisture back into the air. The tiny water droplets will float around once they leave the humidifier with the essential oil droplets. This can help reduce the chances of getting nosebleeds, calm the irritation in your throat, and help you sleep more comfortably. A quality essential oil humidifier will allow you to sit and enjoy the aromatherapy benefits of using your essential oils. They’ll disperse the oils from the humidifier when you switch it on, and this can help you relax and unwind. It’s also useful for combating bacteria and viruses. If you have kids, you know how important this is around cold and flu season! Pet parents can use it to make their homes smell nicer too! Allergies can be miserable, and they can last all year long. If you have indoor allergies to dust or pet dander, the dry air can add to your irritation levels. An essential oil humidifier will increase the moisture levels to help soothe irritation. You should see a reduction in your allergy symptoms. You may even not have to use your allergy medication on a daily basis anymore! Have you ever tried to go to sleep but you just can’t relax? Maybe you have to get up several times during the night for a drink of water because your throat gets dry. Putting a humidifier in your room with a soothing blend of essential oils is one way to fall asleep faster. The added moisture can prevent irritation to your airways and throat, and this can stop you from waking up multiple times during the night. Have you ever walked across the floor in your socks and touched something only to receive a small stock? This shock comes from a buildup of static electricity. It builds up when you have dry air, and it can be strong enough to potentially damage your more sensitive electronics. Adding moisture to your air will almost eliminate any static you may have. You don’t want your humidifier that uses essential oils to burn out because you didn’t realize that it ran out of the water. Some humidifiers come with automatic on and off switches that let your humidifier switch off when the water levels reach a certain point. This safety feature can extend the life of your device. Take a look and see where and how you add the essential oil or essential oil blend to your humidifier. This will clue you into how easy or difficult it is to clean and maintain. Additionally, you’ll also be able to tell how much oil it will hold and how long it takes you to add the oil. You should be able to quickly and easily adjust how much mist your aromatherapy humidifier puts out. If it puts out too much, it could overwhelm you with the essential oil smell and add too much moisture to your home’s air. Too much moisture can encourage dust mite growth. Look for a humidifier that has at least two mist adjustment settings, if not more. Even though your essential oil humidifier is slightly larger, it shouldn’t have to be noisy when you have it on. You want something that is going to run silently in the background, and many essential oil diffusers come with decibel ratings right on the box. How large is your humidifier’s tank? This will directly dictate how long the humidifier runs for between cleaning. The larger the tank is, the most mist it’ll be able to put out when it runs. Bigger tanks are great for large spaces because they can disperse the essential oil’s scent throughout. Smaller tanks work well for use in the bedroom or enclosed areas. Maybe you’re going to go to sleep, and you don’t want your humidifier running at all hours of the night. A timer built into your humidifier lets you pick how long it runs for before it shuts off. Some humidifiers also have settings where it’ll run intermittently before shutting off. This sleek and stylish essential oil cool mist humidifier is capable of filling both large and small rooms. It can run for 50 hours between fills, and there is a small essential oil tray where you add your pure essential oils before switching on the fan. It has a mist output of 270mL per hour from a 1.6 gallon reservoir. You’ll get 360-degree rotating nozzles with this humidifier coupled with a completely adjustable steam and mist output knobs. This allows it to fill the entire room with mist and essential oils. There are no expensive filters to worry about changing every few months. Additionally, it comes with an automatic shutoff button that stops it from overheating if you forget to fill it. The blue LED light doubles as an excellent nightlight. This recently upgraded essential oil diffuser and cool mist humidifier uses ultrasonic vibrations to disperse the oils into your home’s air. It comes designed to output more mist than the old version to keep your home comfortable. You’ll get a sleek and modern design that lights up with seven different LED colors that allow this humidifier to double as a nightlight. You use 100-percent pure essential oils in this humidifier for a stronger scent. You get several programmable time settings that let you choose how long or short this humidifier runs when you switch it on. The automatic shutoff will switch the humidifier off when the water gets low, and this ensures that the motor won’t burn out. It comes with a whisper-quiet operation, a 100mL tank, and it runs for six hours per fill. You can pick from three different colors with this diffuser humidifier. It holds up to 150mL at a time, and it has a pleasantly powerful output for being small enough to fit into your palm. You get seven bright LED lights running around the middle of this humidifier, and they come in both bright and dim settings. It’s made out of BPA-free materials, and it also comes with a whisper-quiet operation. Once you fill it and switch it on, this humidifier can run between six and eight hours before it automatically shuts off when the water and oil get low. You get a 45-day guarantee, and you get a year warranty against defects or damage. Finally, the solid base is larger to add stability to this diffuser humidifier. The water reservoir on this essential oil humidifier is clear, and this allows you to easily see when you need to add more water to it. You get an LED light strip that shows you your humidifier’s status at a glance, and it also doubles as a pretty nightlight. The taller and more narrow design allows you to place this product in a variety of spaces. It comes with nozzles that can swivel 360-degrees and fill the entire room with moisture and scent. You also get adjustable mist control settings to get precision output in both large and small rooms. Once you fill it and let it run, this device can run for a full 24 hours before you have to fill it again. It has a two-year warranty attached against defects and damage. This cool mist diffuser and humidifier uses pure essential oils to produce a cooling mist that is great for aromatherapy. You can set it to run for a single hour or three hours before it switches off. The compact design makes it easy to have in a variety of spaces, and it works well for both small and medium rooms. It runs between six and nine hours on a single fill. Also, you can cycle through seven LED colors that run around the middle of the device as well as along the top. The wood grain texture fits into a variety of decors, and it has small feet to add a layer of stability to the base. You get a full year warranty when you purchase this product as well that protects you against it failing or damage. 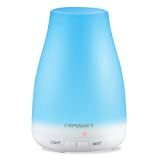 My pick for the best oil diffuser humidifier is the Everlasting Comfort Ultrasonic Cool Mist Humidifier. It’s a cool mist humidifier that features a sleek and stylish design that is capable of filling a large room with soothing scents and moisture. I loved that it could run for up to 50 hours between fills. Additionally, the fact that it came with a small tray for my essential oils was another bonus. The automatic shutoff feature was great for when I get busy and forget to refill it, and it works as a nightlight in case I have to get up in the middle of the night. All of these things pushed it to the top of the list! Previous Post Humidifier vs Diffuser: Which should you buy?